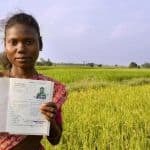 Land rights (or property rights) occupy a unique place on the global development agenda: Either you are fanatically passionate about the issue, or you’ve never heard of it. But whether you know it or not, land rights and their resulting conflicts touch upon many of the sectors and countries that development agencies focus on. The scale of land insecurity is daunting; approximately 72 percent of the world’s population – more than 4 billion people – live on physical property for which they do not hold formal rights or documentation. In many countries, people have little if any protection for their land, and are vulnerable to the risk of land disputes, fraud and evictions. In fact, in many countries, landlessness is the best predictor of poverty. So property rights represent the key institutional asset on which people could build their livelihoods. The lack of property rights is a persistent obstacle to social cohesion, financial inclusion and economic growth. It’s a barrier, according to a growing body of evidence, that appears to present an outsized challenge to poverty alleviation. Solving the problem will require a new paradigm of investment and collaboration. That’s why Mercy Corps Ventures has been building off of Mercy Corps’ work in the sector and taken a deeper look at equity investment opportunities in property rights, specifically addressing barriers to growth for companies operating in the space. 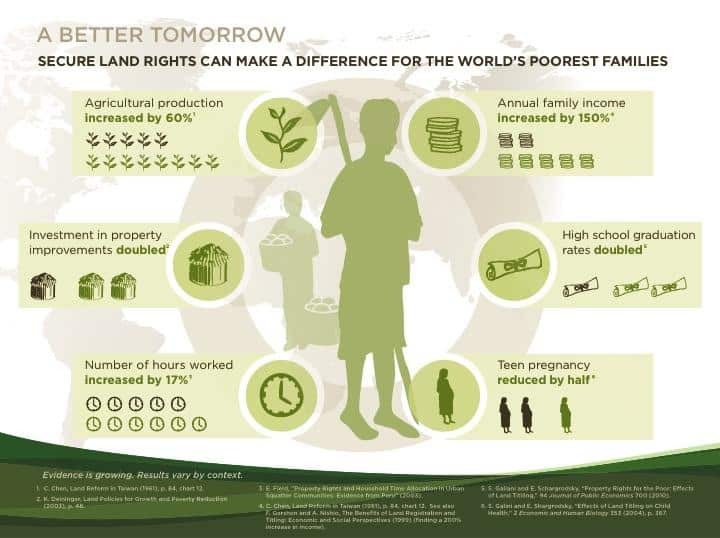 We were at the World Bank Land and Poverty Conference 2019 last week, where 1,500 participants from government, academia, civil society and the private sector came together to discuss the latest research and innovations in land rights. 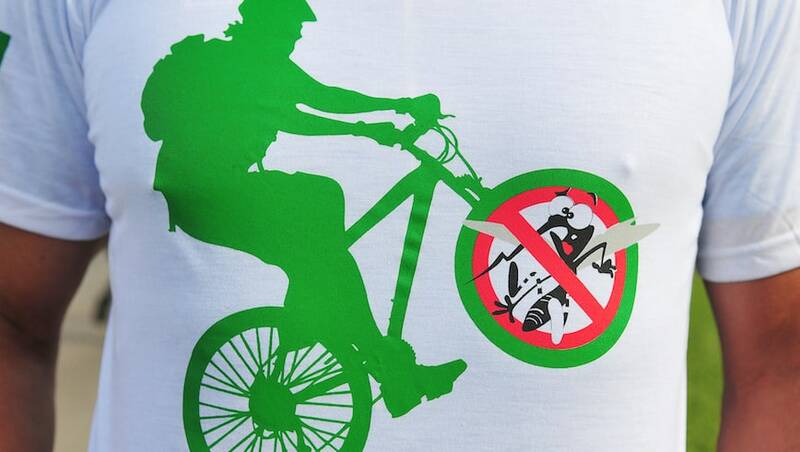 Here are the top seven things that you should know about the issue. The Institute for Liberty and Democracy (founded by Hernando de Soto) has estimated that the value of informal assets (including land and property) globally is almost $10 trillion. This wealth constitutes – by far – the largest source of potential capital for development. It is an order of magnitude greater than foreign aid, local government assets and all the loans/assistance extended by the World Bank combined. A global study found that stronger property rights were associated with an average eight–point rise in annual growth of per capita income. However, if these assets are insecure, they are at risk and not necessarily integrated into or leveraged by the formal market (for instance, by enabling access to finance, among other things). One in four people are worried about losing their home. Length of tenure, more so than documentation, is a determinant of security (eg: people who have lived in a place for less than five years feel much more worried about eviction than those who have lived there for more than 10 years). Most people without land title documents do not know how to obtain them. The land titling process can vary dramatically from country to country, and government plays an obvious and critical role. However, the titling process often requires a complex array of service providers: notaries, architects, surveyors, lawyers, as well as fixers to simply manage information and documentation flows. This often makes the service prohibitively costly for low-income households. And even if it was affordable, there aren’t enough of these service providers available to map the hundreds of millions of land parcels globally. Some organizations have been taking an alternative approach, recognizing that even basic land tenure data has value. Cadasta empowers communities and citizens to collect, manage and record geospatial and household data as evidence of their occupancy, land and resource rights. 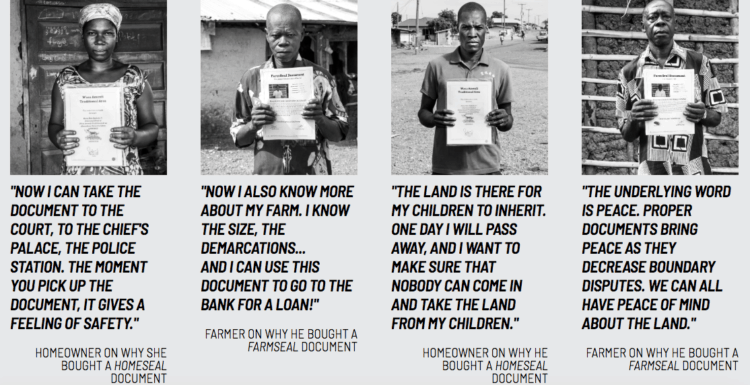 And Meridia has extended thousands of customary land documents to rural smallholder cocoa farmers in Ghana: When balancing time and cost versus a full title, these documents provide nearly the same level of protection and value. We’re only just starting to see how remote sensing and machine learning can be game changers in the property rights space. Suyo is exploring machine learning to automate more of the work typically done by lawyers and architects. Meridia’s robust and flexible global platform has been able to drastically drive down the cost of rural surveying and land document production by a factor of up to 5x. And Cadasta’s powerful data platform is available to any individual or organization to leverage. New open source algorithms can automatically detect smallholder farm boundaries. Satellite imagery continues to decrease in cost, while simultaneously increasing in accuracy and resolution. And emerging drone technology, like that developed by Micro Aerial Projects, is meeting or surpassing local regulatory standards for surveying accuracy, which could allow mass surveying (of thousands of households) in less than a few hours, for a tiny fraction of the current cost. In spite of the promise of the solutions explored above, funding remains a challenge – yet forward-thinking organizations are finding creative responses. TerraNova in Brazil has designed an innovative approach that involves community engagement, urban planning and (most critically) financing instruments that enable informal residents to formally purchase their land with full title, thus avoiding and/or resolving large–scale conflicts between landowners and existing occupants. Despite driving down the cost of land documentation significantly, Suyo discovered early on that one of the biggest barriers to scaling its services was the lack of financing for low-income customers to purchase formalization services. That’s why, on March 26, Omidyar Network and Mercy Corps Ventures were excited to announce an innovative financing mechanism that provides appropriate and affordable land formalization service financing for low-income families. The Suyo Catalytic Property Rights Facilities will facilitate land tenure for thousands of low-income Colombian households and unlock millions of dollars in wealth. We hope that this will spur a revolution in financing for land formalization, unlocking other additional sources of return-seeking and blended capital. If you’re interested in learning more about this experiment, we’ll be posting updates to our Medium blog as the program develops. Tim Rann is a partner at Mercy Corps’ Social Ventures team. Image courtesy of lau rey.